When I received last month’s OBM and saw the National Rally seafront scene at Rhyl, I was quite taken aback, thinking it was the same rally I took part in, but then I realised my own efforts had been in 1962. My machine was a 1957 Norton Dominator that I bought new and sold about 10 years ago. The idea of taking part in the 18th ‘National’, which had just been advertised in the motorcycling press, started when we were chatting at the Halifax and District Motorcycle Club’s weekly meeting and I learned that club secretary Cliff Jessop had ridden in it four times. After mulling it over, I decided to enter the July event, but because my good lady Vera was expecting our first-born that September, I didn’t have a navigator. 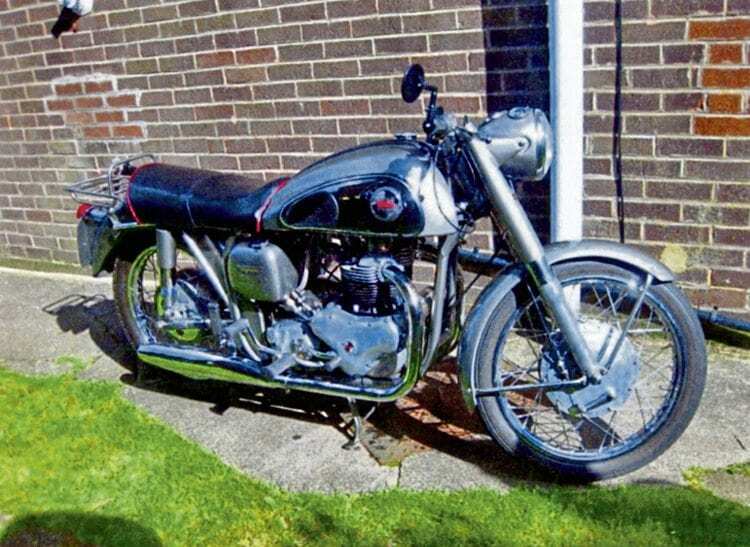 John Kerridge’s trusty 1957 Norton Dominator, which he bought new, was sold just 10 years ago. from Rhyl, where it finished. That would make my total riding distance more than 720 miles – and all this when most motorways hadn’t even been built. I started planning the route, but then Eric took over, so all I had to do was save up for my petrol money. The Dommi was doing around 65mpg, so the trip would use a minimum of 12 gallons depending on how hard I rode the bike considering the terrain and winding roads on the chosen route. This would work out at £2-18s. Could I really afford it? Five days before the start I received the final instructions, along with one mileage amendment that wouldn’t affect us, and July 8 finally dawned. I seem to remember it being a fine morning, and as my starting time from Leeds was to be 10am, I left home at about 8.30 to pick up Eric and get there in time. We had an uneventful ride to Skipton, where we clocked in at the Snaygill filling station on Keighley Road before heading another 50 miles to Thirsk Market Place and then to York, 25 miles on. The weather was still reasonable but the wind was getting up. and as we were ahead on time, we took a rest at our next stop, Northampton, after another 40 miles. The next port of call was Stratford-upon-Avon, another 40 miles on, where we passed the theatre on our way south to Banbury, a mere 20-mile loop to allow us to get our correct final mileage. At Worcester we had a two-hour break on some camp beds that had been provided. By this time it was two o’clock in the morning with more than 200 miles still to go. After being woken up, fed and watered by the good people of Worcester, we were off again, heading for Presteigne in central Wales, but along this stretch the weather became blustery and rain started to fall steadily before really becoming wet and windy a few miles later. After signing in at Presteigne we departed for Rhayader through the Radnor Forest area, and as we rode along one of the country lanes we encountered a fallen tree across the road. We managed to get by after breaking off a few of the top branches, and rode on just as a local Welsh crew arrived to clear the road for any other vehicle that might want to get by at that time of night. port of call, Ludlow, had been a mere 25 miles from our previous stop, from Rhayader it was 40 miles, but the weather gradually improved as we approached the town and finally dried up altogether, with the wind dropping to a gentle breeze. and then the Bala checkpoint, which I think was manned by the Llangollen Motor Cycle Club. There, we were redirected to the special test at the North Wales road racing circuit at Rhydymwyn on our way to the finish at Rhyl. The special test involved riding from a standing start at a given average speed over an undisclosed distance not greater than 880 yards. The speed, not exceeding 30mph, was to be announced at the start of the test, but not the exact distance, and after passing the final check we should proceed immediately to Rhyl via the approved route. I remember that the average speed on the special test was to be 26mph, and after a bit of thought on how to tackle this, we decided to accelerate up to 52mph, timing our acceleration between the achieved 26mph and the 52mph, and try to replicate the same while slowing down to the 26mph mark, then maintaining 26mph for the rest of the distance – and it seemed to work reasonably well judging by the results. We were now on our ‘last lap’ with just about 20 miles to go to the finish, where we arrived at about 9.30am. We’d been on and off the saddle for 23 ½ hours and were looking forward to getting home – but that was still 120 miles distant! I don’t remember much about our reception by the local authority at Rhyl, but we were well received and directed to a parking space where we spent a couple of hours among a multitude of other competitors and their machines, all looking a bit weary. I eventually arrived home after delivering Eric to his house. I have no idea what the time was, and all I know is that I must have slept the sleep of the dead that night. The results arrived during the first week of August, informing me that I’d won the Norton Motors manufacturer’s silver cup and a finisher’s plaque with the maximum marks – altogether a terrific result. him to cancer several years later – a good man through and through. Previous Post:Those were the days – welcome to Rhyl, 1954!